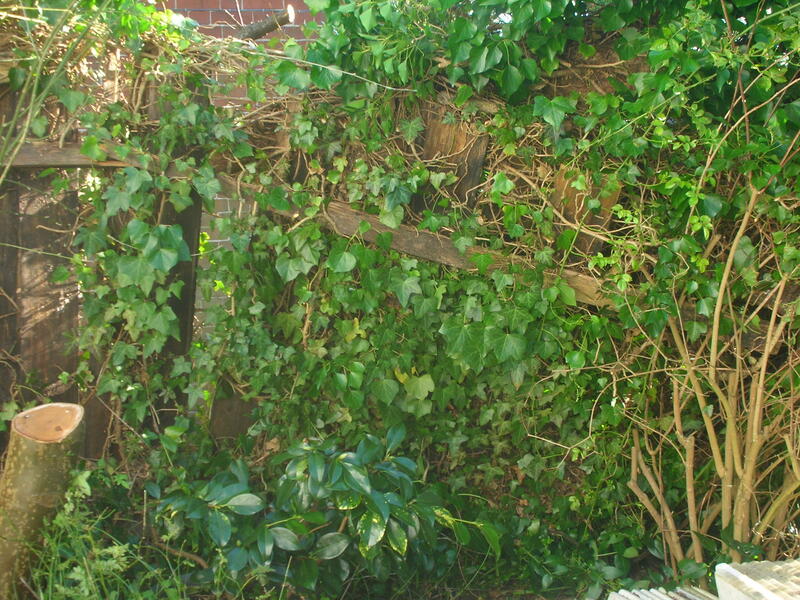 Because we are about to put up our first greenhouse, we have been clearing a chaotic corner of the garden, cutting back rampant lilacs and tearing down even more rampant ivy. Our neighbour has been doing the same on the other side of the fence and, what with the gales and the age of the fence, there has been a grand collapse. 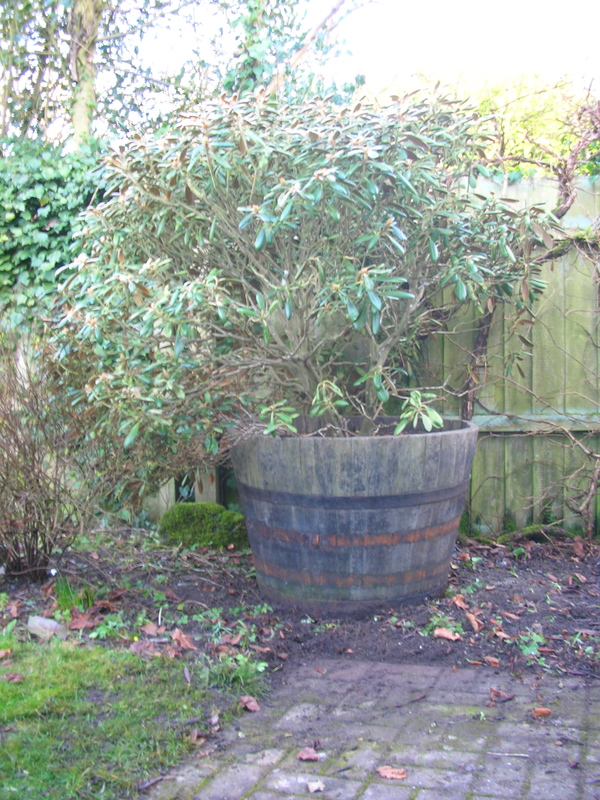 In the meantime, kind friends who had come to stay took me up on a lighthearted suggestion that we all move the rhododendrons in tubs on the other side of the house, which had grown so big that they were closing the passageway. This was not a trivial task. But they weren’t put off and so project number two is now underway. Today a bolt of sand was delivered and somehow, in the next few weeks, we will create suitable hard standing for a greenhouse and three giant tubs of rhododendrons, as well as repairing the fence and creating a new log store. I like a spring challenge. As far as nature is concerned, this is spring. 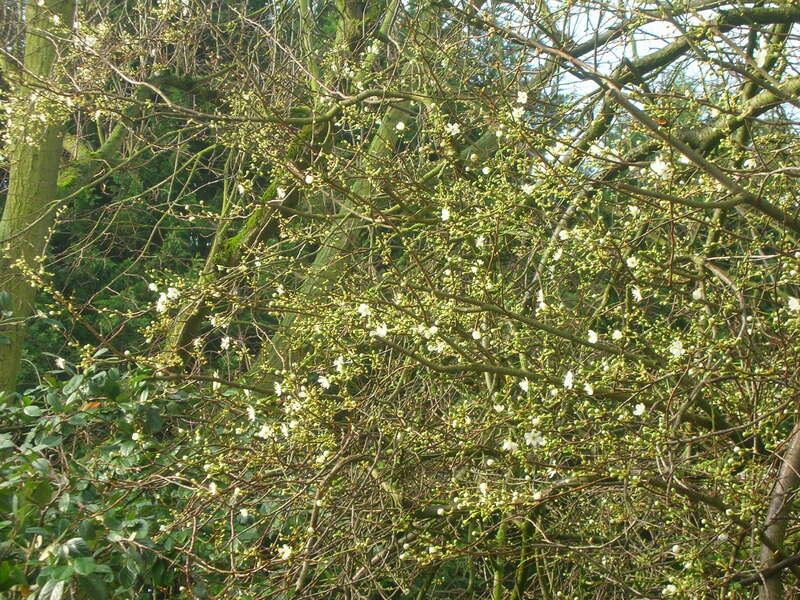 The plum tree is in blossom. 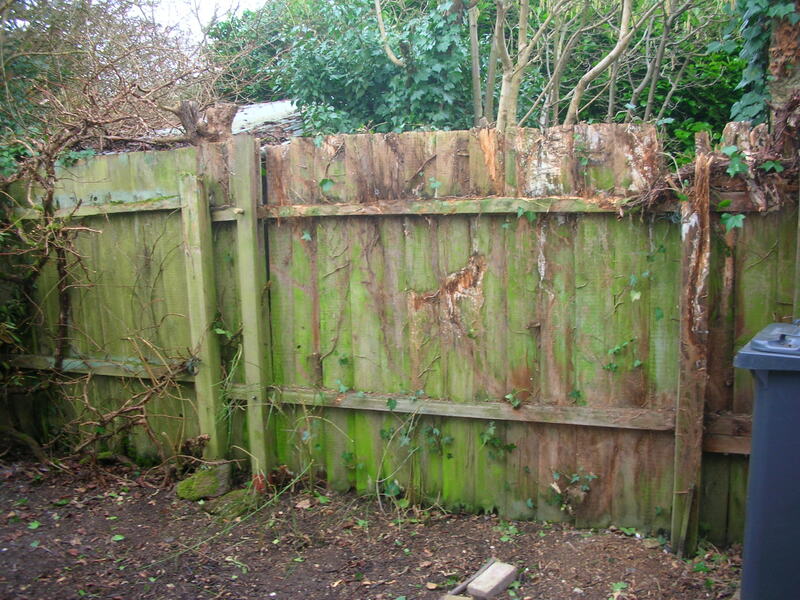 This entry was posted in Gardens and tagged fencing, ivy, lilacs, rhododendrons, tubs by hilarycustancegreen. Bookmark the permalink. Luckily, whatever the weather, the seasons insist on rolling around. Your spring will come. Rampant lilacs? Cutting them back? Oh, how I envy you! In the small town where I spent my youthful days in the US Midwest, every spring the air was filled with the sweet scent of lilacs that I had never experienced before. It was like I was in a dream. I tried to raise them here by planting saplings again and again, but always to no avail. They would bloom, but the scent is totally lost. The fragrance always comes back only in my memory together with all the sweet experiences of the youthful days. On a warm day in spring lilac scent is truly delicious… but, they only last three weeks, they are dull the rest of the year and they sucker all over the garden – so a mixed blessing. Over many years I have probably dug up ten full grown trees, but there are always some left and I do love them in their moment of glory. This sounds like a mix of fun and hard graft. 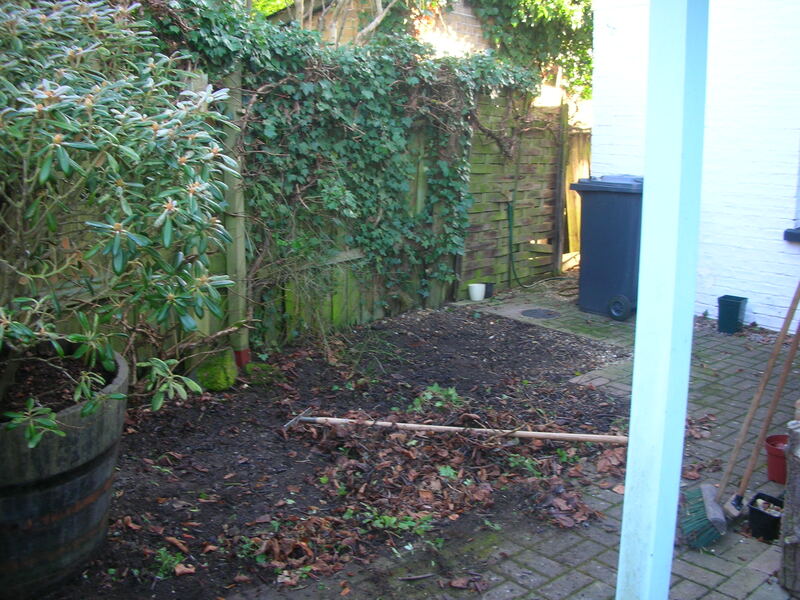 There is something therapeutic in rearranging the garden on a grand scale. I hope it turns out the way you wish. A greenhouse is lots of fun too. I am envious. Exactly and I love both the fun of rearrangement and the graft, my husband tends, understandably, to prefer these grand schemes coming in one at a time. I’ve waited a long time for the greenhouse, now I will need to justify it, by producing super veg all year. Hilary, you are quite the energetic one! Very ambitious plans that appeared to have worked out well. A greenhouse? Actually, that sounds like a good idea. Hmmm. I simply love projects. I love all the phases: creative, engineering, labour and completion. And I have a patient husband. It always bothers me to cut back any plant, I like them to go crazy, but I know it has to be done once in a while. Putting some in the pots is a lot of work, but it’ll look great when you’re done. The funny thing with many plants is that the more you cut them back the more enthusiastically they grow. They always win. 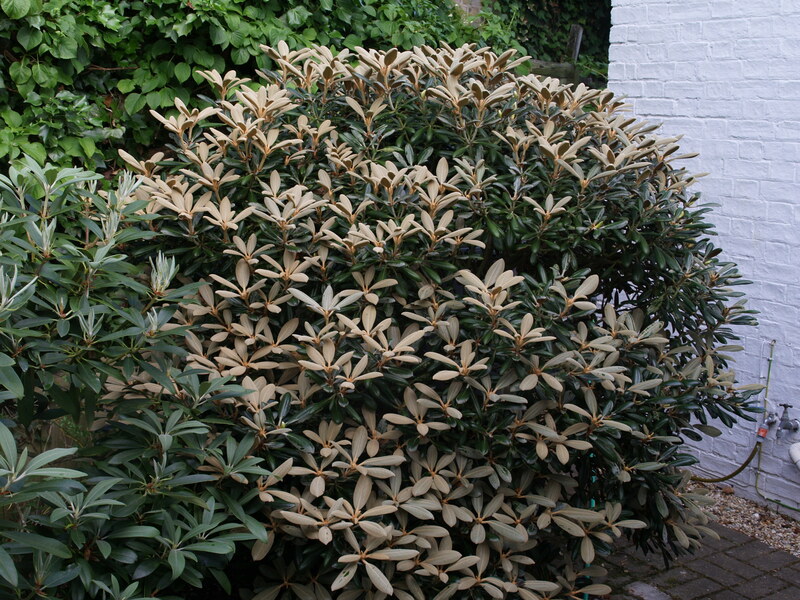 We are foolish to grow rhododendrons as our soil local soil is too alkaline for the, so we have to grow them in pots. But it’s worth it. the plum tree looks amazing. you are so lucky to have a big garden! 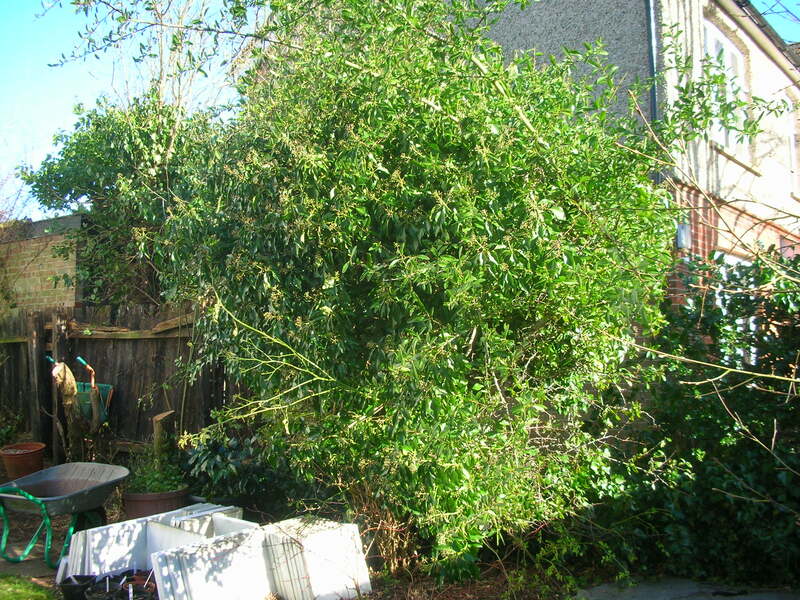 dru and tony have done wonders at toft lane – you would not recognise it! It’s strange, but the garden grows with the years. There are always more corners to find. I have passed Toft Lane several times recently. I must actually drop in next time. And the upside ii that all this makes writing a novel seem easy. I wish! Though I do think that having two contrary interests helps both. Four of us (two men, two women – all pensioners), a door and some very well co-ordinated heave-ho-ing. To be honest, I thought I’d never see it moved. I assumed it would fall apart, but the top and bottom band held. It looks rough now, with it’s North face looking outward, but it will still be a picture in three months time.